The APD unit is designed for areas that would benefit from the unit placed at an angle. The larger pit allows for ample working space and better under ground access. The finished frame is placed 90 degrees to the setting position. 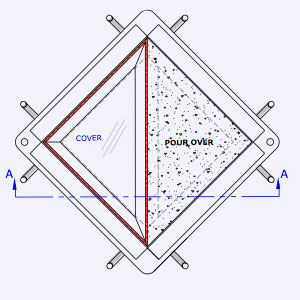 The accessible angle utilizes our standard Model ADL frame with your choice of cover type, the balance of the unit is tied in with the poured floor. Units are available in nominal 6 inch increments in length ,width and depth. Selecting the overall unit size needed using either the dimension information chart of the Model ADL section 2-2 or the Model POL section 3-2. Selecting the aluminum frame size needed for the accessible side.